The Chow Chow is susceptible to entropion, skin disorders and hip dysplasia It is important that when contacting a Chow Chow breeder that you express health concern issues and ask the breeder what they are doing in order to help mimimize them. 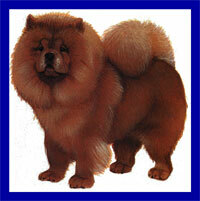 Please don't purchase your Chow Chow from a petstore which commonly are known to support Chow Chow puppy mills. Doing so only promotes inproper breeding ethics and promotes current Chow Chow health issues. The AKC, UKC, FCI, CKC, SKC, WWKC, FIC registries recognize the Chow Chow breed standard. Country of Origin: China - closely related to other Nordic/spitz type dogs with some Mastiff - can be traced to the 11th century BC when Tartar hordes invaded China. .
Temperment: Although domineering around other dogs, Chows are usually good with children. This breed needs to get to know other household pets early in life and is cautious with strangers. Care Regular thorough brushing is required.